The merit badge plan is based on the concept that a counselor working closely with a Scout acquaints the boy with an adult knowledgeable in one or more fields. The counselor introduces the Scout to subjects that may lead to a career choice or to a lifetime hobby. From astronauts to high-tech patent holders to corporate officers in the electronics industry, many people's careers grew out of their early involvement in Amateur Radio. Today's youngsters need a chance to expand their horizons both intellectually and socially through wholesome, challenging and constructive activities. The millions of boys who can now be exposed to Amateur Radio through Scouting may not have that opportunity in years to come. Though we can't realistically expect "Radio" to compete with required badges such as cooking, camping and first aid with active counselors, we have the opportunity to reach thousands of 11- to 14-year-old Scouts. We're betting that with your experience and enthusiasm for Amateur Radio, many of those Scouts will quickly outgrow the limitations of the Radio Merit Badge and seek your help in earning their tickets. Though earning the badge represents a significant achievement to a Scout, he still can't transmit with it. Scouts must complete each step of the Radio Merit Badge requirements even though they may already hold an Amateur Radio License. What's the first step? Get the approval of your regional BSA Council. They'll explain the merit badge counselor's role. Start with a local Boy Scout troop. If you're a newcomer to Scouting, simply call your local Council office; most are listed in the white pages of the telephone book under "Boy Scouts of America." Tell them you want to register as a counselor for the Radio Merit Badge and they'll put you in touch with the right person at the District or Council level. "Merit badge counselors must meet the Scouting membership requirements. Hams must become a registered adult Scout. (The registration fee is waived.) They must be men and women of good character over age 18, recognized as having the skills and education in the subjects for which they are to serve as merit badge counselors, as well as having the ability to work with Scout-age boys." They'll want your name, address and phone number, and permission to release them in a listing of the Council's merit badge counselors. The list is distributed annually to all Scout troops in your area. They'll also want to know why you're interested in becoming a radio merit badge counselor and what your qualifications are. The fact that you're an FCC-licensed radio amateur and an adult who knows the importance of a youngster's developing an interest in the sciences, a familiarity with modern technology, a first-hand appreciation of other cultures and a personal sense of citizenship in the world should be sufficient. Don't forget to pick up a copy of the revised Radio Merit Badge pamphlet that should be available through your Council office or local Scouting supplier. Steve Place is an Eagle Scout and a lifelong Scouter. More Radio Merit Badge Counselors are always needed. Hams wishing to register as counselors should contact their local BSA Council office. Phone numbers are available in your local white pages or on the Internet at www.scouting.org/localcouncillocator.aspx. Individuals who wish to serve as merit badge counselors should submit the BSA Merit Badge Counselor Information form (No. 34405) and an adult leadership application (No. 28-501) to the local council service center. (Both forms can be downloaded at www.scouting.org/forms.) For further resources click here. Merit badge counselors must be at least 18 years old, proficient in the merit badge subject by vocation or avocation, able to work with Scout-age boys, and registered with BSA. 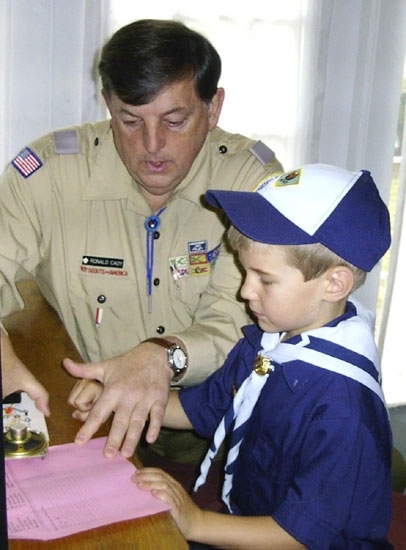 Counselors must agree to follow the requirements of the merit badge, making no deletions or additions, ensuring that the advancement standards are fair and uniform for all Scouts; have a Scout and his buddy present at all instructional sessions; and renew their registration annually to continue as a merit badge counselor.